Gregory Poole’s Electric Power Generation Team is committed to exceeding our customers’ expectations while helping our customers to reduce their overall operating cost. Whether you are powering health care facilities, data centers, water treatment plants, lift stations or financial institutions, Gregory Poole Power Systems is your single source provider for all your power generation needs. We specialize in standby power, prime power, load management, cogeneration and temperature control equipment. 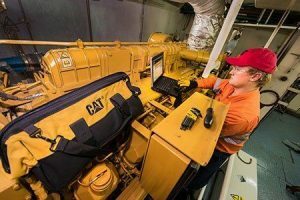 Our technicians are available for installations, programmed maintenance and repairs to all engines, generator packages and power quality products. Cat® industrial engines are ready for your application. These engines deliver the unsurpassed reliability, durability, fuel efficiency, and low cost of ownership you have come to expect from Caterpillar. And our world-class product support will never let you down. Our power systems service representatives can assistance you in developing a preventative maintenance plan for your switchgear. We can assess your system requirements and put together a package consisting of regular inspections of your paralleling gear, monitoring gear, peak shaving gear, control centers and other key components. We also offer 24/7 emergency response.